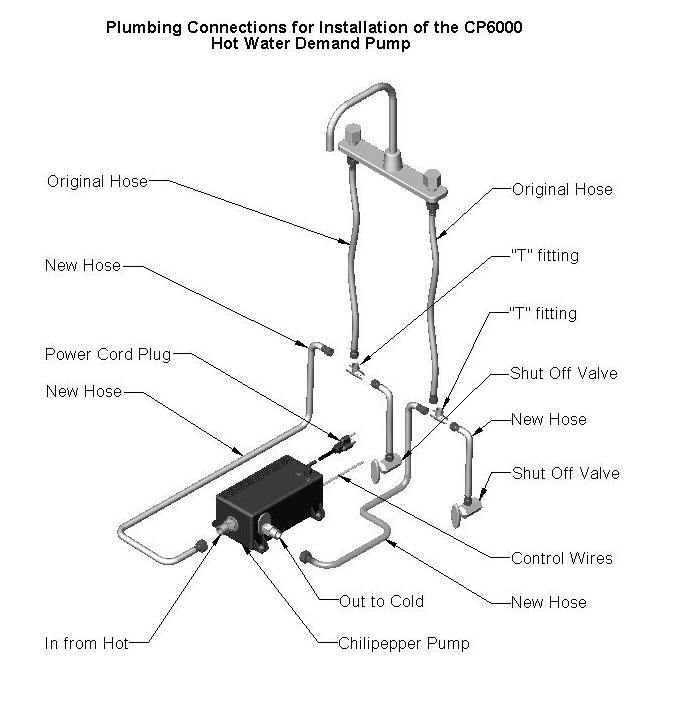 Easy installation instructions for the Chilipepper CP6000 hot water demand system. 1. Install a 110 volt outlet under the sink if there isn’t already one there. 2. Turn off the supply valves under the sink. 3. Place the Chilipepper on the floor of the cabinet. (It has rubber feet. 5. Mount the push button and attach the control cable to the button. 6. Turn on the supply valves, momentarily run the faucets to remove any air. 7. Plug the Chilipepper power cord into the 110 volt outlet. before installing a Chilipepper pump. Add-A-Tee adapters are available at many hardware stores. Using the Add-A-Tees allows you to install the Chilipepper with only two hoses. On the front of the Chilipepper there is a small black knob. This knob controls the shut off sensitivity. Turning the knob clockwise increases the distance the hot water travels, and counter-clockwise reduces the distance the hot water travels. Connecting the Chilipepper to buttons and/or a remote receiver. NOTE! The Chilipepper operates when the push button or momentary contact is RELEASED!If you hold the button closed for more than about 15 seconds the pump will think there is a short circuit and begin to jog for 1/4 second twice every 15 to 20 seconds to tell you there is a short in the button or control wires. If a remote receiver gets stuck in the on position the same symptoms will appear. An illuminated button will also cause the same symptoms.